When it comes to night time photography, I will readily admit that my husband, Rich, is far more invested in it than I am. 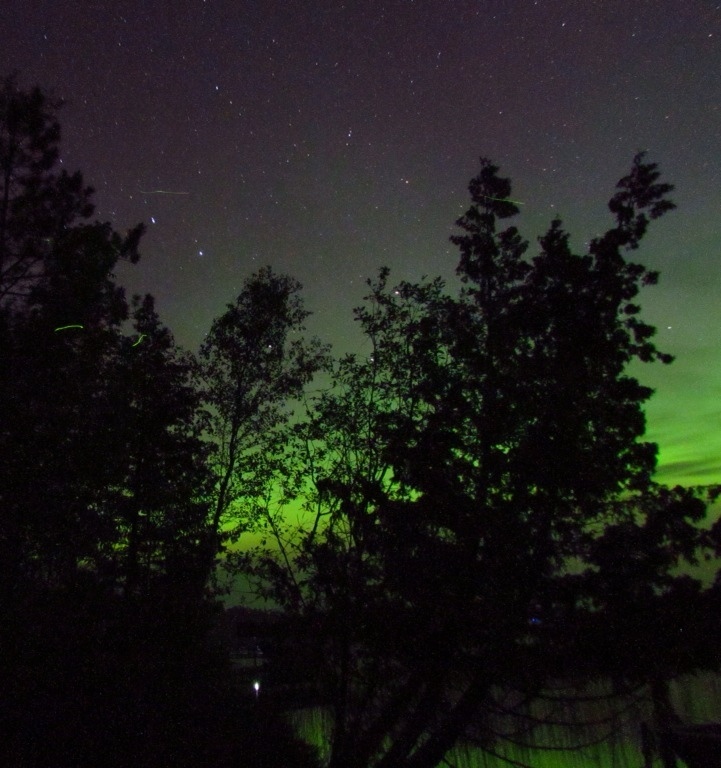 He constantly tracks the solar activity with his tablet apps, reads what the local experts are saying, and gets alerts to tell him the likelihood of Northern Lights appearing. Most nights I let him get up while I roll over for more sleep. Last night I agreed to doing some “star tracks” – photographing the stars with a long exposure to show their movement through the sky. It meant getting up at midnight and setting up our cameras for a 30 minute exposure. The benefit of being at the cabin was the short distance from our beds to the tripods down on the shore. We could easily retreat from the bugs and hang out in comfort while waiting for our photo shoot to finish. That worked for me. 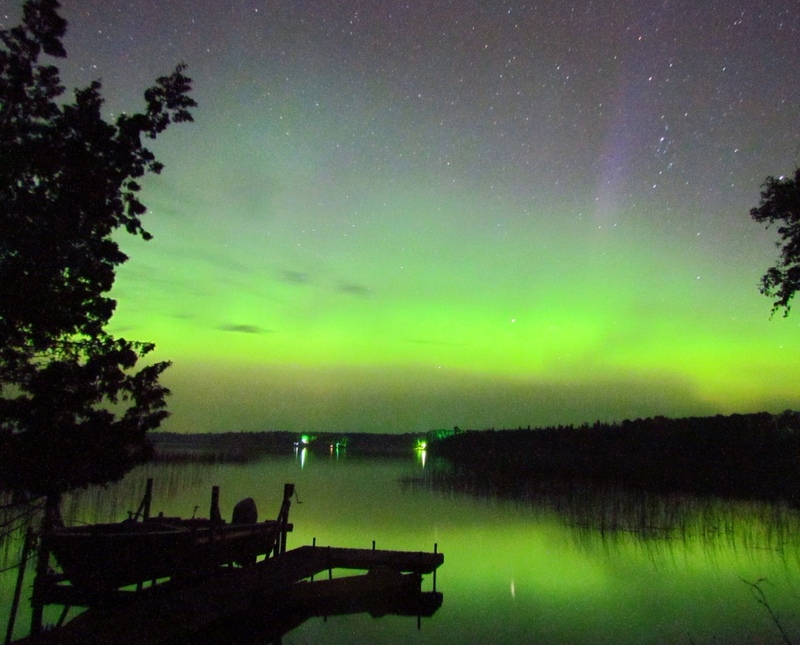 Upon our return to the dock, the faint green glow we'd noticed earlier above the lake had intensified to a level of bona fide Northern Lights. We quickly turned our cameras toward the light activity, readjusted our settings and set out to capture the display. I found it to be a lot more rewarding than star tracks. With only 60 second exposures, we had rapid feedback for each photo, and plenty of time to shoot and reshoot. Good thing, as I still fumbled through the settings and made plenty of blunders along the way. But no matter, the lights obliged with changing shapes and degrees of brightness, providing plenty of material for practicing. To be honest, it wasn't the most spectacular display of Northern Lights I've ever seen. But their reflection in the calm lake was a bonus. And seeing the results on my little camera screen was even more rewarding. In fact, they looked better there than in reality. I know I shouldn't admit that. Sometimes the camera can enhance nature, and it may be best to keep mum. But I'm still learning on all fronts. In time I was able to tear my focus away from just the Northern Lights and consider other elements in my view. I was especially pleased with my attempt to get both the Lights and the Big Dipper in one photo. We were out on the dock for hours. It was past 3:00 am by the time we were ready to fold up our tripods and turn off the cameras. But I was no longer tired, and had learned to endure the biting mosquitos without flinching and jeopardizing my photos. Our star track photos turned out to be duds, and we deleted them without hesitation. 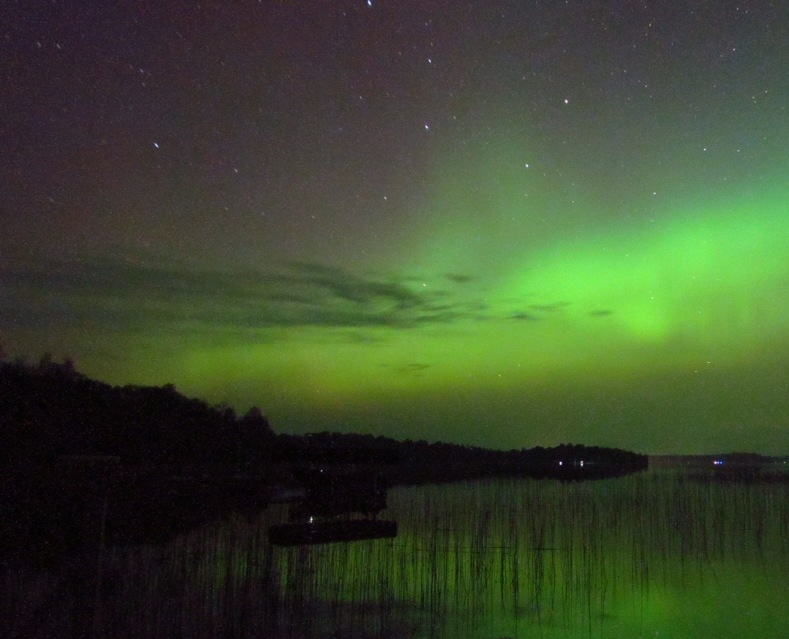 But they were well worth it for leading us to the Northern Lights display. Next time Rich's alerts go off, I think I'll crawl out of bed with him. I'd like to capture them again. This entry was posted in Life Up North, Outdoors and tagged Cabin, Lake, Outdoors, Photography by Molly. Bookmark the permalink.